The Spanish conquerors were amazed to see such a bright red colour in Aztec costumes, art, face-painting - and on sale in pressed bars in Aztec markets. Nothing like it existed in Europe! Moctezuma ordered many bags of it every year as tribute from his lands to the south and east. 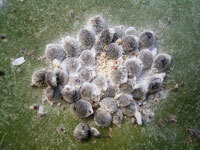 Cochineal comes from squashed female bugs that live in the prickly-pear cactus in Mexico. They’re tiny, and around 70,000 of them were needed to make a pound of red dye! 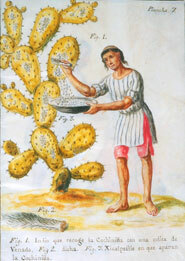 The Aztec word for cochineal was nocheztli from two words: nochtli (cactus) and eztli (blood). The Aztecs themselves called it ‘the chilli-red colourer’. 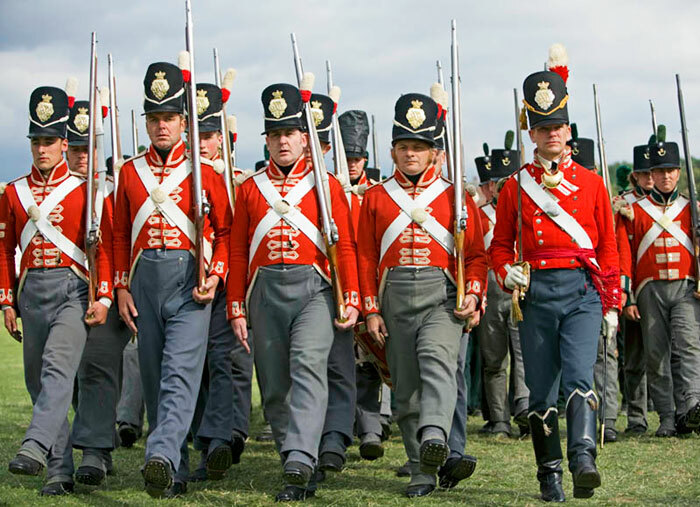 For some 250 years (from the end of the 17th century) the British Army adopted red as the uniform colour for its soldiers: in the early period most wore ‘madder red’ (a vegetable dye with a history of nearly 5,000 years of use in the Middle and Far East) while officers wore the brighter scarlet red obtained from the more costly cochineal dye. In fact, it was so expensive that ‘throughout most of Renaissance Europe, only aristocrats and wealthy elites were allowed to wear scarlet. By law, peasants were forbidden to wear the colour’ (Amy Butler Greenfield). 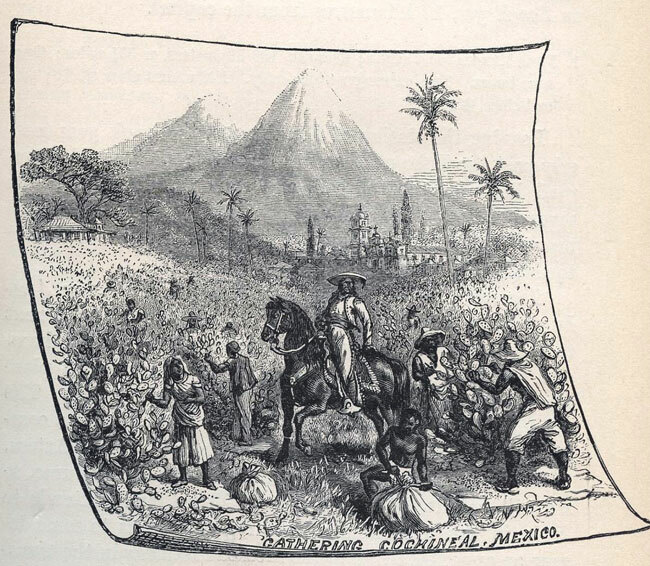 And, given that Mexican cochineal is ‘the most potent natural red dye in the world’, it’s little wonder that its production soon became a mainstay of the Spanish Empire’s economy, remaining so for some three centuries. 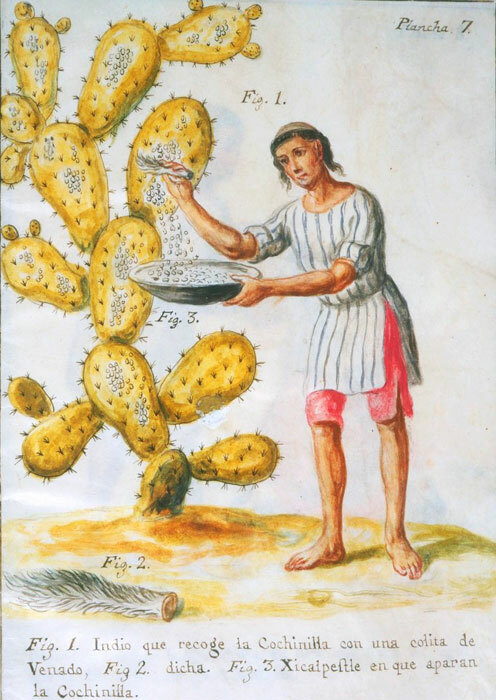 Any foreigners caught smuggling cochineal from the Spanish colonies faced the death penalty. In its heyday (the 1770s) over 1.5 million pounds were being produced in Mexico each year: given that some 70,000 insects were required for each pound of dye, that’s over 100 BILLION bugs being harvested each year! 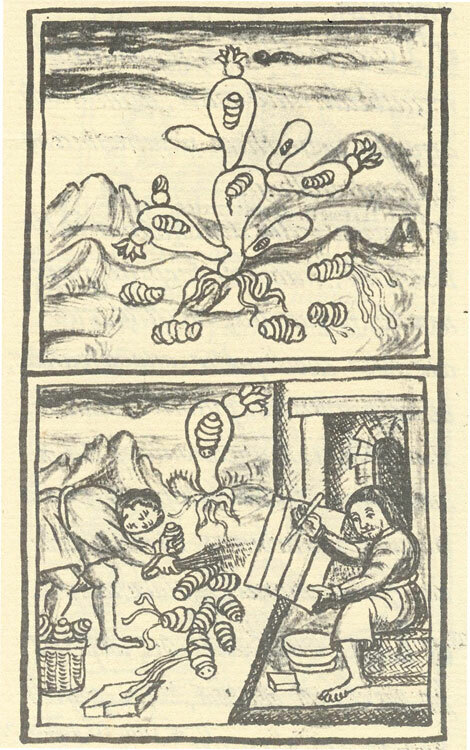 Its luxury good status led to cochineal being quoted regularly on the London and Amsterdam Commodity Exchanges. Used for dyeing Catholic cardinals’ cassocks and the uniforms of Buckingham Palace guards, the extract was highly prized. 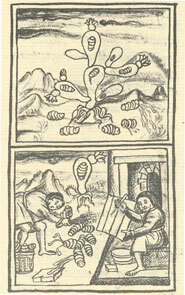 Yet throughout Europe, mystery surrounded the source of this dyestuff - the Spanish encouraged the popular idea that it came from berries or cereal (wheat) grains - hence its Spanish trading name grana fina or granilla; indeed it was referred to in the Cochineal Treatise and in Spanish trading documents as semilla (seed), no doubt to help disguise its origin. 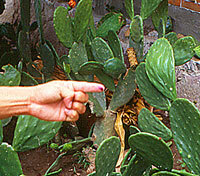 The insects are protected during the rainy season by coverings placed over the cactus plants on which they are feeding. 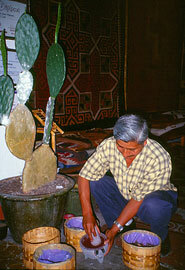 After pleasant weather has returned they are taken out and planted or sown on the different species of Opuntia... known to the Mexican natives as nopal. The male insect, which is very rapid in its movements, flies to the female, and, after the act of fecundation [mating], the female attaches itself to the plant and remains stationary, rapidly enlarging from the development of an immense number of eggs within the body, and, in this distorted condition is knocked off the plant with feathers and dull knives, and either dipped into hot water and afterwards sun-dried, or killed by being placed in heated ovens. A few are left, however, to deposit their eggs, shortly after which they die. 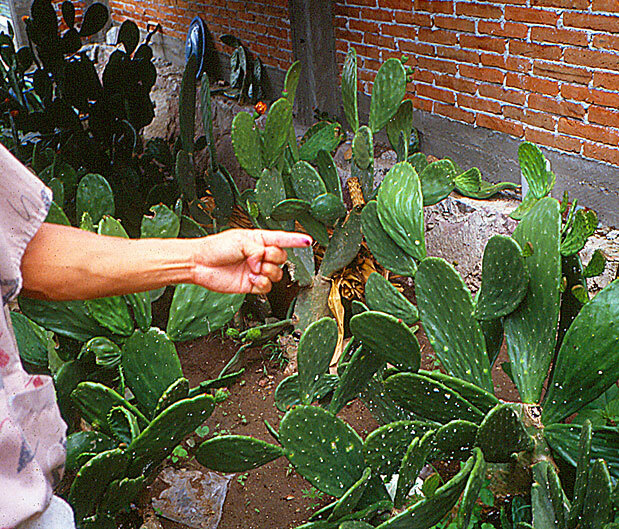 The eggs, hatching in the sun, give an innumerable supply of young insects, which at once distribute themselves over the plant, and begin feeding, In this manner 3 crops are gathered yearly from the nopal plantations. 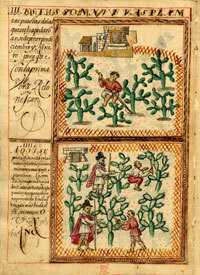 The full yearly production cycle is illustrated in the Cochineal Treatise (shown at the top of this page are scenes 3 - depicting the newly cut, pruned and planted cacti - and 4 - showing new insects being placed, under Spanish supervision, on the new plants ‘which must be six months old’). 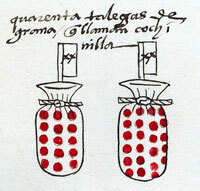 Scholars such as Frances Berdan have spotted an interesting development in the last years of the Aztec Empire, noticing that cochineal featured regularly and heavily, alongside cotton clothing, precious feathers, gold, greenstones, cacao and fine woods for carving, in the tribute lists recorded from the conquests made under Moctezuma II: these are largely raw materials compared to the mainly manufactured goods demanded by his predecessors, suggesting a shift in priorities. ‘Moctezuma required resplendent objects decorated with royal and other Mexica designs to demonstrate his power, and these would be most accurately and exquisitely fashioned by his own craftsmen’ (‘Moctezuma’s military and economic rule’ in Moctezuma: Aztec Ruler, 2009, p.187). 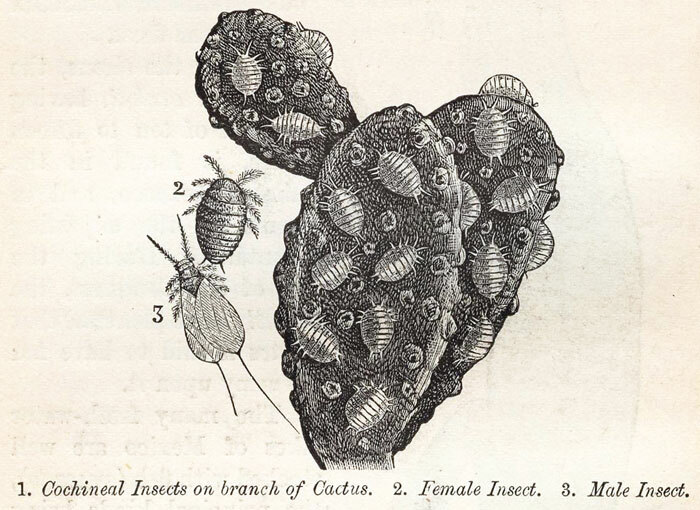 It was the southern provinces of the Empire that provided particularly rich and diverse tributes - many of them labour-intensive - and these included cochineal. A major trading centre for cochineal, strategic bastion for the Mexica, and gateway to the Mixteca region, was the town of Coixtlahuaca, a seat of Mixtec royal power and focus of important manuscripts and sacred maps. Further to the east is the town of Nochiztlan, today just 50 miles north of the state capital of Oaxaca. 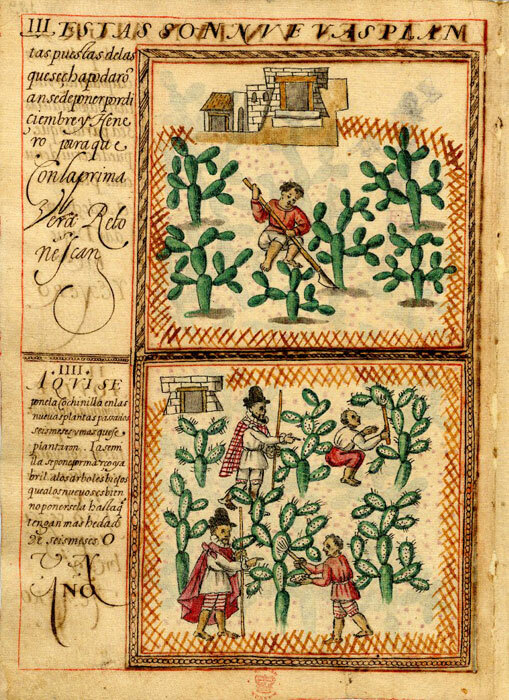 Nochiztlan’s very name marks it as one to be written in red ink, for it means ‘Place of Cactus Blood’: from the Náhuatl noch(tli) (cactus) and eztli (blood). Nochiztlan was a major Mixtec centre and source of cochineal in pre-Hispanic times. Its location, on the intersection of the old and new highways linking Mexico City with Oaxaca City, gives it continued prominence that perhaps ensured its survival to this day. Ironically, the demand for cochineal is making something of a comeback as consumers return to natural products: today, it is used as a fabric and cosmetics dye and as a natural food colouring. 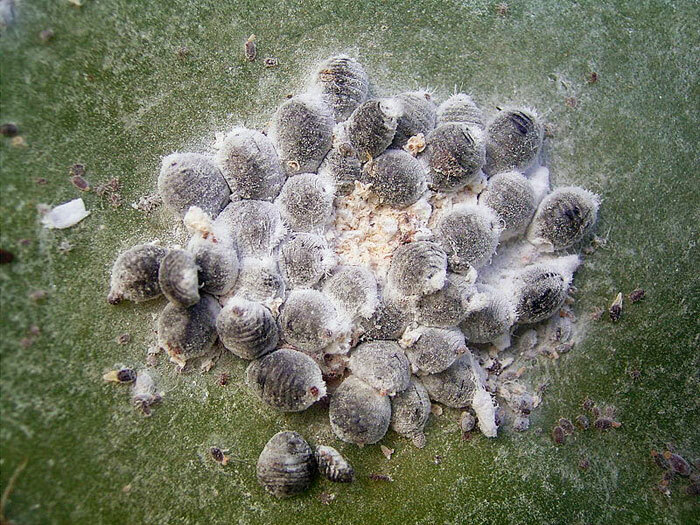 Peru is the leading producer of cochineal - though some claim that working conditions among isolated cochineal farm workers are well below acceptable standards.